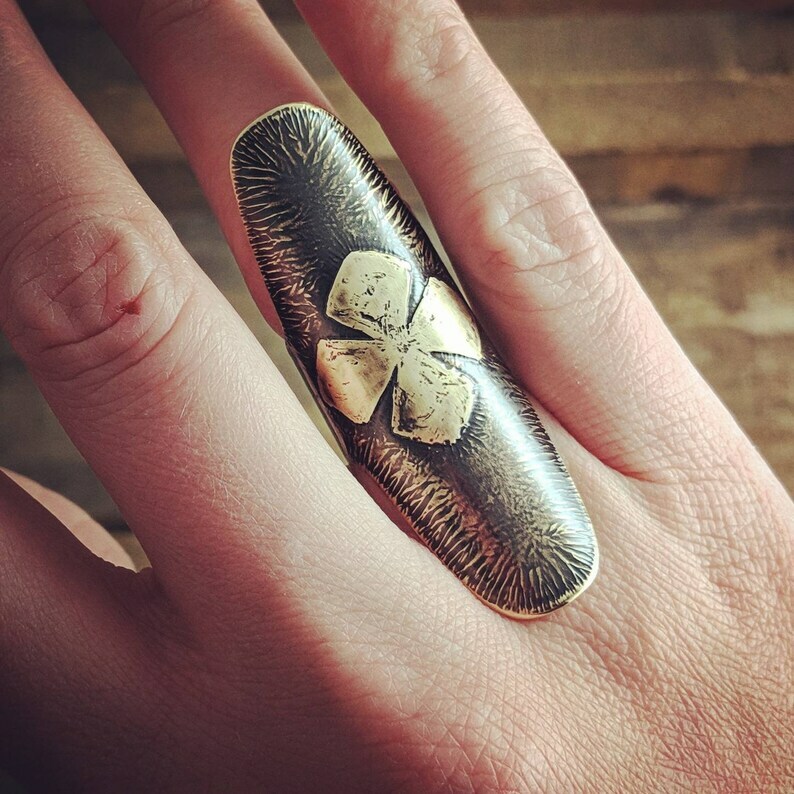 A glamorously large hand pierced and formed brass knuckle ring, with a hand drawn and etched cross on the exterior, has a nice weight to it, yet is extremely comfortable to wear. The interior that bears my makers mark E², is hammered and sanded smooth for a comfortable feel against your skin. The organic and rustic textures are a lovely side-effect of the etching process, and lends a ancient feel to the ring. The meaning of the cross is very simple, faith, protection, and solidarity. The shield-like pattern reminds me of medieval times, where one would wear their armor at all times for protection against the unknown. A much more affordable metal than silver, brass has such a gorgeous and organic color to it. Since the cost of silver has tripled in the past year or two, I have begun using metals such as brass and copper in many of my designs, to offer a more affordable price point. The same amount of labor goes into creating a piece with an alternative metal, but the price can be anywhere from $15.00-$75.00 less than if silver were used, depending on the size of the piece. 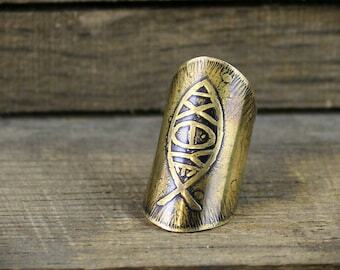 Dimensions - 2.35" long and approx .90" wide depending on the size of finger it is shaped for. The ring shank is .70" wide.